Those Danes... MAN are they awesome filmmakers! 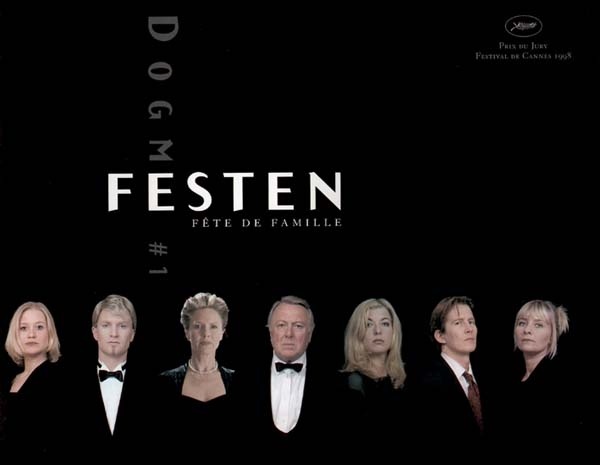 Festen was the very first of the Doge 95 movies, and after watching it, you'll understand that the movement caught on and spawned more than 250 other movies. It's 100% brilliant filmmaking all the way through. I wouldn't label it as mindfuck, but it's definitely a movie that'll pack the greatest punch if you have no preconceptions about what you're about to watch. Still, if you've never watched a Dogme film before: the shaky hand-held camera, the lack of make-up, the raw images that come from not using any filters or special lightning, the unexceptional story-lines that doesn't contain any action scenes... it will take a bit getting used to. Because Festen is drama, pure drama, and nothing but drama. It's about as good as a drama film can get. You'll laugh, you'll cry, and you'll kiss all admiration for Hollywood goodbye. This is an absolutely brilliant film - the original and best of an amazing genre that i have really enjoyed getting into. This is drama and its best and everyone should see it! I'm glad you enjoyed it! Myself, I'm really looking forward to see the Danish Oscar winner Hævnen!